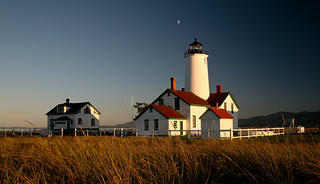 The New Dungeness Light Station is maintained by volunteers, who stay for about a week at a time. This story was originally published in the July-August 2010 issue of Preservation magazine. Location, location, location—it’s what makes any lighthouse indispensable, including New Dungeness Light Station in Washington State. Punctuating the end of a five-mile ribbon of sand and driftwood at the entrance to Puget Sound, New Dungeness has served as an essential beacon for sea captains traversing the Strait of Juan de Fuca for more than 150 years. When we had the opportunity to volunteer here as lighthouse keeper, we grabbed the chance. How could we resist a bracing week in a spectacular setting, smack in the middle of a wildlife refuge? We couldn’t. And the payoff exceeded our expectations. We witnessed bald eagles fishing in the early morning, a coyote prowling at dusk, sea lions just off the beach in the afternoon. Day and night we watched the parade of vessels cruising the strait in front of us—from tankers and ferries to fishing boats and nuclear submarines. We took in the drama of the snow-crested Olympic Mountains gleaming at daybreak and the serenity of sunset as the lights of Victoria, British Columbia, began glowing to the north. But best of all, for seven days we lived in and cared for a historic 1857 light station, one of the first to be built on the west coast of the United States. Our group of six relief keepers—the two of us, one relative, and another family of three—arrived on a breezy Saturday morning, ferried over hard-packed sand at low tide by a trained lighthouse volunteer in a four-wheel-drive vehicle. After unloading luggage and a week’s provisions (enough to stuff two refrigerators), we received a walk-around tour to learn about tools, equipment, paint, keys, and the radio. After sharing an enchilada casserole around the large dining table, we retired early to a comfortable queen-sized bed, the arched window opposite framing a perfect view of the lighthouse. We awakened the next morning in time to raise the flag in advance of the prescribed 0800 deadline, only to find we’d been beaten to the task—the opening salvo in a friendly competition to see who would hoist the flag each day. Afterward we began quizzing one another about light-station facts to share with day-trippers: How tall is the tower? Sixty-three feet, lowered in 1927 from 91 feet. WHere’s the original Fresnel lens? In the Seattle Coast Guard Museum. How old are the buildings? The masonry lighthouse dates to 1857, the wood barn to 1887, the original oil house to 1894, and the wood-frame keeper’s cottage to 1904. The light station's lantern room. All volunteers perform regular duties, such as lawn care, brass polishing, window cleaning, and daily sweeps of the spiral staircase. 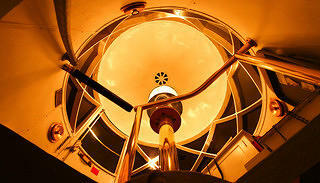 They also must offer guided tours that include the lantern room. During our unusually quiet off-season week in early May, we had only 15 or so takers. One young Florida woman arrived in a kayak, but the rest came on foot, hiking the 10-mile round trip on the sand. In addition to routine housekeeping, we also took on maintenance projects that included painting, mounting hooks in bedroom closets, and scraping the base and supports of the flagpole. In 1979, Wheeler and Commander Joseph Blackett negotiated a first-of-its-kind, 20-year lease for East Brother Light Station on an island in San Francisco Bay. A nonprofit raised contributions, obtained a matching grant from the Interior Department’s Marine Preservation Program, and opened the 1874 light as an unusual accommodation offering bed and breakfast, dinner, and a round-trip boat ride. East Brother provided a sustainable volunteer model, allowing the Coast Guard to maintain the navigational aid while divesting itself of responsibility for the entire property. 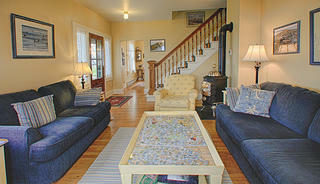 The living room inside the New Dungeness Light Station. According to a National Park Service inventory, about 70 historic light stations have since been leased to local nonprofits or state or local governments. Around 250 have been transferred out of federal ownership, roughly half to states and local agencies, the rest to nonprofits (about 50) or private individuals (about 75). Approximately 400 light stations in every form of ownership remain active aids to navigation. The Coast Guard retains responsibility for more than 90 percent of those. In 1983, Wheeler founded the U.S. Lighthouse Society to assist local groups restoring and preserving American lighthouses. The society’s most significant legacy may be that it helped persuade Congress to pass the Lighthouse Preservation Act of 2000. This amendment to the National Historic Preservation Act provided a mechanism for federally owned lighthouses listed on (or eligible for) the National Register of Historic Places to be transferred at non cost to other federal, state, or local entities or to nonprofit organizations for educational, park, recreational, or historic preservation purposes. New Dungeness offers one example that works—brilliantly. Seven hundred dues-paying members (mostly local individuals and families) vie for the chance to work here. By performing routine maintenance duties, as we did, the volunteers keep the light station in fine shape. Maintaining a constant roster of visiting keepers who will conduct tours and generate interest among new and potential members also helps sustain and protect this stunning historic site. One evening, as we peered out from the New Dungeness lantern room into the moonless darkness, we identified several nearby beacons, each distinguished by its own signature flash—Smith Island, Ediz Hook, Point Wilson. They all seemed reassuring to us, not just promising safety and assistance in avoiding hazards but also confirming a sense of place, and an unbroken connection to 150 years of lighthouse keepers and the mariners who relied upon them.